Zippnewsupdate.info is the PUP that uses misleading techniques to prevent removal. Use Reimage to locate malicious components and get rid of them faster than with uninstall instructions. A full system scan blocks virus reappearance and prevents traffic to malicious domains. Zippnewsupdate.info is a program related to adware that causes slow browser and system freezes. Adware runs in the background of your browser because of constant redirects and additional content. Zippnewsupdate.info is a site that appears on your screen because of the adware virus hiding in your device. When your browser redirects to this site, it immediately delivers messages suggesting to allow push notifications. 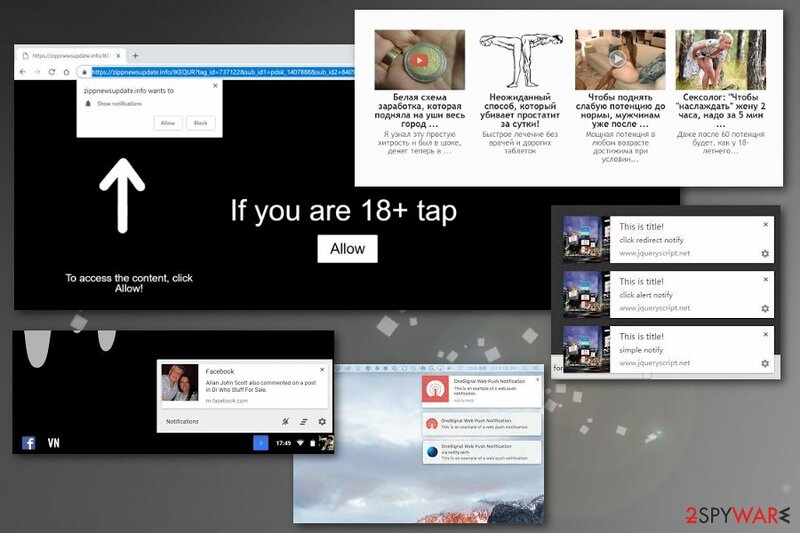 If you happen to allow these notifications, the virus starts providing commercial content directly to your screen, even when you are not using your browser. This redirect virus is affecting all popular web browsers to deliver content that is required by its developers. However, the main cause responsible for this behavior is on the system. Beware that Zippnewsupdate.info virus can also affect the performance of your PC because it launches numerous processes running in the background. Once the potentially unwanted program gets installed on the device, it starts delivering intrusive commercial content and redirecting to sites like Zippnewsupdate.info or Allow Website Notifications, Directlinkkpush.com. All of these cyber infections are related to adware-type programs that are sponsored by commercial content creators. Collect data about your browsing habits. The last feature of tracking users data is the main danger of Zippnewsupdate.info adware. You IP address, location, most viewed sites or items, search queries, and other preferences can be collected and shared with third-party companies for advertising purposes. However, closing pop-up windows or websites and avoiding hyperlinks is not enough to remove Zippnewsupdate.info. You need to scan the device thoroughly with reputable tools like Reimage to clean the system and eliminate all intruders including the adware that is responsible for the intrusive behavior. Zippnewsupdate.info removal using anti-malware or PC repair tools is the best solution because you cannot find the main adware easily on the system. Fortunately, a full system scan indicates all rogue tools, malicious files or unwanted programs, so you can delete them by following suggested steps. Remember to double-check after this and change browser settings to default, block additional notifications on every browser on your device. Zippnewsupdate.info is a virus that delivers desktop notifications and redirects traffic to questionable websites. Paying close attention to installation processes on the device can make a huge difference in the state of security because opting for Advanced or Custom installations allow you to control what programs get installed on the machine. Since skipping through steps during Quick installations automatically agree to every part of the download list, software bundles get on your system. Software bundling is a technique that allows freeware publishers and PUP developers to pack their product together and distribute them on the internet. When you choose Advanced installation, you can see additional content and de-select the automatic download. This way you avoid PUP infiltration. Also, selecting reputable sources for your applications is a crucial step when you want to keep your machine safe. You need to remove Zippnewsupdate.info immediately after it starts to frustrate you with commercial content. For the process, you should use trustworthy anti-malware tools. We have a few suggestions below if you do not have antivirus on the device. Perform automatic Zippnewsupdate.info removal and be sure that there is nothing left on the PC that might be related to this adware. Scanning the system thorougly will improve the speed of your device and the performance of your browser significantly because all background processes can be ended this way. Also, do not forget to get rid of Zippnewsupdate.info virus damage. You can do so by manually changing settings of your browser and making sure that you block all notifications from commercial content-filled sites. Here, look for Zippnewsupdate.info or any other recently installed suspicious programs. Wait until you see Applications folder and look for Zippnewsupdate.info or any other suspicious programs on it. Now right click on every of such entries and select Move to Trash. When in the new window, check Delete personal settings and select Reset again to complete Zippnewsupdate.info removal. Once these steps are finished, Zippnewsupdate.info should be removed from your Microsoft Edge browser. Here, select Zippnewsupdate.info and other questionable plugins. Click Remove to delete these entries. Now you will see Reset Firefox to its default state message with Reset Firefox button. Click this button for several times and complete Zippnewsupdate.info removal. Here, select Zippnewsupdate.info and other malicious plugins and select trash icon to delete these entries. Click Reset to confirm this action and complete Zippnewsupdate.info removal. Here, select Extensions and look for Zippnewsupdate.info or other suspicious entries. Click on the Uninstall button to get rid each of them. Now you will see a detailed dialog window filled with reset options. All of those options are usually checked, but you can specify which of them you want to reset. Click the Reset button to complete Zippnewsupdate.info removal process. ^ John E Dunn. Google is tracking your location, even when the setting is turned off. Nakedsecurity. Computer security news, advice and research. This entry was posted on 2018-11-14 at 03:31 and is filed under Adware, Viruses. You can quickly scan the QR code with your mobile device and have Zippnewsupdate.info manual removal instructions right in your pocket. How did you remove Zippnewsupdate.info?